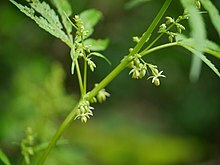 Female flower tops, or ‘Cannabis Flos’, are often used in preparation of cannabis tea. Cannabis tea (also known as weed tea, pot tea, ganja tea or a cannabis decoction) is a cannabis-infused drink prepared by steeping various parts of the cannabis plant in hot or cold water. Cannabis tea is commonly recognized as an alternative form of preparation and consumption of the cannabis plant, more popularly known as marijuana, pot, or weed. This plant has long been recognized as an herbal medicine employed by health professionals worldwide to ease symptoms of disease, as well as a psychoactive drug used recreationally and in spiritual traditions. Though less commonly practiced than popular methods like smoking or consuming edibles, drinking cannabis tea can produce comparable physical and mental therapeutic effects. Such effects are largely attributed to the THC content of the tea, levels of which are drastically dependent on individual preparation techniques involving volume, amount of cannabis, and boiling time. Also in common with these administration forms of cannabis is the heating component performed before usage. Due to the rather uncommon nature of this particular practice of cannabis consumption in modern times (in contrast to historical use), the research available on the composition of cannabis tea is limited and based broadly around what is known of cannabis as it exists botanically. According to a 2007 study published in the Journal of Ethnopharmacology, the composition of cannabis tea is affected by criterion including, but not limited to, the duration of time over which the cannabis is steeped, the volume of tea prepared, and the period of time for which the tea is stored before consumption. The study mentions the ways in which levels of THC and THCA impact variability of composition by changing the bioactivity of the beverage. Therefore, cannabis teas that include less bioactive cannabinoids, “based on HPLC peak area” will demonstrate varying compositions. According to a recent study on cannabinoid concentration and stability in preparations of cannabis oil and tea, a boiling period of fifteen minutes was found to be sufficient in order to reach the highest concentrations of cannabinoids in tea solutions. However, preparation of cannabis oil in the study was found to ensure a higher stability of cannabinoids than that which was found in preparation of cannabis tea. Aside from recreational drinking of cannabis tea, the beverage has also been used for centuries in folk medicine to treat rheumatism, cystitis, and various urinary diseases. Cannabis tea is controlled as a derivative of cannabis in most countries as is required of countries whose governments are party to the United Nations‘ Single Convention on Narcotic Drugs. However, similar to the regulation surrounding alcohol content of kombucha, there are some forms of cannabis tea with cannabis levels considered to be highly undetectable. These variations of the drink do not contain the psychoactive cannabinoid known as THC (delta-9-tetrahydrocannabinol) and, instead, contain the non-psychoactive cannabinoids CBD (cannabidiol) or CBN (cannabinoid)—both of which tend to go undetected in cannabis use/intoxication drug tests. As such, the legal status of cannabis tea is largely dependent on its composition and preparation. Cannabis tea is scheduled at the federal level in the United States by nature of being a derivative of Cannabis sativa, and it is therefore illegal to possess, buy, and sell. Due to variances in statewide laws, however, the federal legislation has little impact on nationwide use, and is “generally applied only against persons who possess, cultivate, or distribute large quantities of cannabis”. As such, regulation of recreational and/or medicinal growth and use on an individual level is not the responsibility of the federal government. In Colorado, for medical purposes, cannabis tea is a “Medical Marijuana Infused Product” which is “a product infused with medical marijuana that is intended for use or consumption other than by smoking, including edible products, ointments, and tinctures. These products, when manufactured or sold by a licensed medical marijuana center or a medical marijuana-infused product manufacturer, shall not be considered a food or drug for the purposes of the “Colorado Food and Drug Act“, part 4 of article 5 of title 25, C.R.S.” Colorado currently stands as one of 33 states that have laws legalizing marijuana as of 2018. Although not as widely published as the beneficial, therapeutic effects of cannabis tea, adverse effects of consumption have been found to exist, in addition to known adverse effects of cannabis use in general. Based upon the findings of select studies, it appears as though such effects occur mainly as a result of unconventional methods or dosage used when interacting with the decoction. Possible adverse effects of cannabis tea via intravenous injection have been published via a 1977 study by Dr. Robert B. Mims and Joel H. Lee. The administered solution was one prepared using cannabis seeds (as opposed to the more commonly used female flower head) boiled in tap water with no further filtration. The effects on the four Caucasian youths were said to be immediate and included “nausea, vomiting, abdominal pain, watery diarrhea, [and] chills” among others. This event and the accompanying study is dated, and the adverse effects experienced were very likely only attained by blatant disregard for sanitation and quality of administration. According to a short communication published in the Journal of Ethnopharmacology, based on the research of Zias et al. regarding cannabis use in ancient childbirth, cannabis is said to have been used to form a decoction with other specific medicinal herbs to terminate a pregnancy in its second to third month. The following is a list of plants used the specific decoction for the termination mentioned by the midwives interviewed for the study: “C. sativa L./Cannabaceae; Atropa baetica Wilk./Solanaceae; Nerium oleander L./Apocynaceae; Ruta montana L./Rutaceae; Peganum harmala L./Zygophyllaceae; Agave americana L./Amaryllidaceae and Urginea maritima L./Liliaceae)”. ^ Russo, Ethan (2013). Cannabis and Cannabinoids: Pharmacology, Toxicology, and Therapeutic Potential. Routledge. pp. 37–51. ^ Peltzer, Karl (Summer 2008). “Use of traditional complementary and alternative medicine for HIV patients in KwaZulu-Natal, South Africa”. BMC Public Health. 8: 255. doi:10.1186/1471-2458-8-255. PMC 2503977. PMID 18652666. ^ Patton, George (2002). “Cannabis use and mental health in young people: cohort study”. The BMJ. 325 (7374): 1195–1198. doi:10.1136/bmj.325.7374.1195. ^ a b c d Hazekamp, Arno (Spring 2017). “Cannabis tea revisited: A systematic evaluation of the cannabinoid composition of cannabis tea”. Journal of Ethnopharmacology. 113 (1): 85–90. doi:10.1016/j.jep.2007.05.019. PMID 17604926. ^ a b Pacifici, R (August 2017). “Evaluation of cannabinoids concentration and stability in standardized preparations of cannabis tea and cannabis oil by ultra-high performance liquid chromatography tandem mass spectrometry”. Clinical Chemistry and Laboratory Medicine. 55 (10): 1555–1563. doi:10.1515/cclm-2016-1060. PMID 28207408. ^ Kabelik, J. (1960). “Cannabis as a medicament”. Die Pharmazie. ^ United Nations Office on Drugs and Crime (1988). “The International Drug Control Conventions” (PDF). www.unodc.org. ^ “Colorado Medical Marijuana Code”. Colorado.gov. Retrieved Jan 4, 2015. ^ “State Marijuana Laws in 2018 Map”. www.governing.com. Retrieved 2018-12-10. ^ Hall, Wayne (January 2015). “What has research over the past two decades revealed about the adverse health effects of recreational cannabis use?”. Addiction. 110 (1): 19–35. doi:10.1111/add.12703. ISSN 1360-0443. PMID 25287883. ^ a b Merzouki, A (Summer 2000). “Hemp (Cannabis sativa L.) and abortion” (PDF). Journal of Ethnopharmacology. 73 (3): 501–503. doi:10.1016/S0378-8741(00)00323-8 – via Elsevier Science Direct. ^ a b c Mims, Robert (July 1977). “Adverse Effects of Intravenous Cannabis Tea”. Journal of the National Medical Association. 69 (7): 491–495. PMC 2536936. PMID 875075. Excerpt from Viv Richards’ autobiography in which he describes using an infusion of marijuana leaves to control his eye problems. Ryan Hurd Health benefits of cannabis tea LiveStrong March 31, 2011.